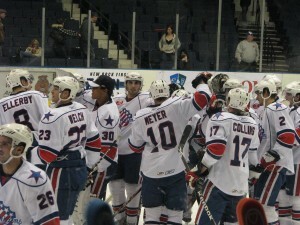 Amerks Send The River Rats Back To The Sewer; Win 4-0 · Let's Go Amerks! Mike Brodeur made his first start in goal with the Amerks a memorable one last night when he shutout the Albany River Rats. He made the Rats (who just beat the Norfolk Admirals 8-1 on Friday night) look like a mess on the ice. But, he wasn’t the only player who really stepped up to show what they can do. Tanner Glass, who has been invisible most of the season, stepped up to grab a Gordie Howe Hat Trick. He tried to fight Dwyer right off of the opening faceoff, but was just handed a slashing penalty which really didn’t do anyone any good. He scored the Amerks’ 4th goal in the third period and got into a fight basically right after coming out of the box for his first penalty. It’s really too bad that it takes the Florida Panther’s GM being in attendance to get something out of Glass. He was rewarded for last night’s play with a call up to the Panthers to play in tonight’s game against the Ottawa Senators. Also, getting a deserved call-up for tonight’s game in Ottawa is Michal Repik, the Amerks points leader. 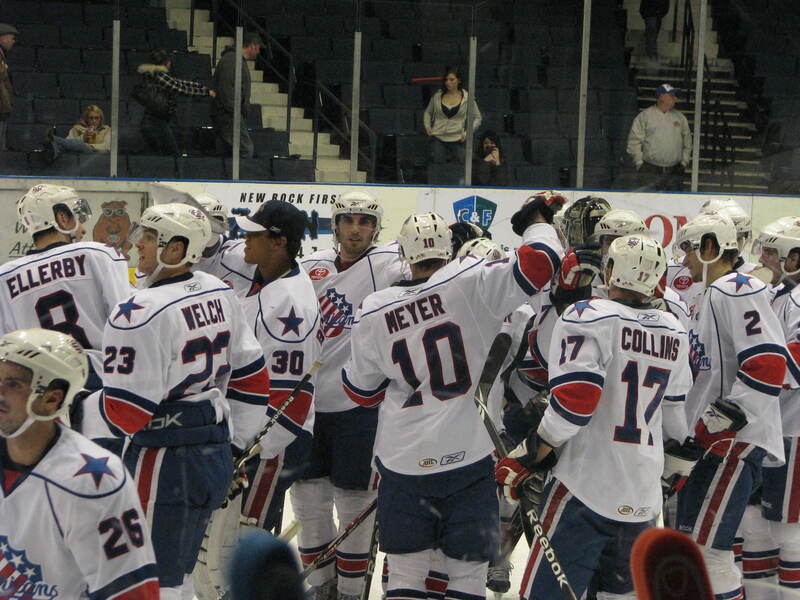 The Amerks certainly all played their best game of the season last night. They came right out of the gate in charge of the game and never let down. The shots are misleading with the Rats only having one less (28 to the Amerks’ 29). The Amerks’ defense stayed on top of things the whole game, leaving the Rats with many shots from the point that were rushed and off. The Amerks were 100% on their penalty kill last night. And it wasn’t by accident. They looked amazing out there. They killed off each penalty with ease…proving that their hard work during practice on their special teams’ skills is starting to pay off. And what a difference playing with the lead makes. The Amerks left the first period up 2-0 and they never looked back. Another player who had a great night was Janis Sprukts. He had two solid goals and almost got the hat trick but, his stick broke in half on the shot, he had the goalie beat. It’s really too bad. We haven’t had a hat trick since 02-17-2007 when Mike Ryan scored a hattie in Syracuse. 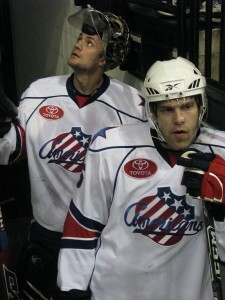 Speaking of Mike Ryan…he plays for the Rats now and didn’t do anything to help them last night. In fact, he was horrible. People complained that the Amerks didn’t pick him up when he was a free agent this year, but he is no better than what we have. Let’s keep looking elsewhere though. The only thing I hope is that the Florida Panthers don’t think that this game shows that we are fine. We are not fine. We need more help. Mike Brodeur may be a spark, but he isn’t the answer. Noah Welch is only going to be here for a few more games at most and Rory Fitzpatrick is out until at least Christmas. Add that up with all the Panthers’ current injuries and it spells disaster. The three stars of the game last night were Stefan Meyer (3), Janis Sprukts (2), and Mike Brodeur (1)…I wouldn’t have put it any other way. And, let’s all look on the bright side…we only need one more win this month to make it better than last December. Keep it going in Texas boys. The Amerks are currently on their way to Texas where they will play the San Antonio Rampage (tomorrow) and the Houston Aeros (Wednesday night). The Amerks beat the Aeros once already this season and are better now than they were then. Come on Amerks. I know you can get a road win in warm and sunny Texas. Go there…and mess with it.